"Mum - what does 'expectorating' mean?". This was a question I asked when, as a child, I accompanied my mother to the local butcher shop. On the wall there was a big sign that said "No Expectorating" - I hadn't a clue. When I found out that it meant "No Spitting" I wondered who would spit on the floor of the butcher shop anyway. 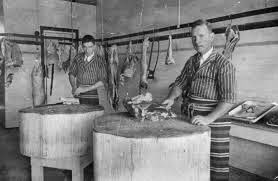 From what I remember of a 1950s butcher shop, it looked a lot like this one, although the photograph was taken at Wondai in 1935. Large wooden cutting blocks standing on sawdust covered floors. Meat hanging by butcher's hooks from a rail that ran along the back wall. Much of the butchery was done in plain sight of the customers - carcasses sawn or chopped on those blocks, which were then rubbed down with salt to clean them. The sawdust floor caught any escaping blood or scraps and was swept up at the end of each day; fresh sawdust was spread over the floor on the following morning. I would imagine that things were even more primitive around the time of WWI - certainly commercial refrigeration would have only been in its infancy. 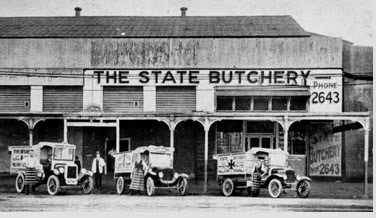 Many readers will be surprised to learn that, in the years during and after WWI, Queensland had butcher shops that were owned and operated by the state. The war time Labor government under premier TJ Ryan and treasurer EG Theodore wanted to ensure that Queenslanders were not disadvantaged by capitalist exploitation, so between 1915 and 1929 there were a total of 90 butcher shops that were government controlled. This enabled the government to fix the price of meat. Here is a photograph of one such store, this one at Albion around 1925. And this is a butcher shop that was built in James Street New Farm in 1901 for Baynes Brothers. It was purchased by the state government in 1918 to be run as the New Farm state butchery. The government's foray into staple products was never really successful. The butcher shops lost money and the government began to close them in 1926. The New Farm state butchery was closed in 1929 and the premises were sold to investors who leased the shop to butcher George Lemke. Ten years later the shop was onsold to Burrows Brothers who renovated the shop and installed a large refrigerated cold room. Burrows Brothers survived WWII rationing and subsequent price fixing, then sold the business to the Petersen family in 1971. 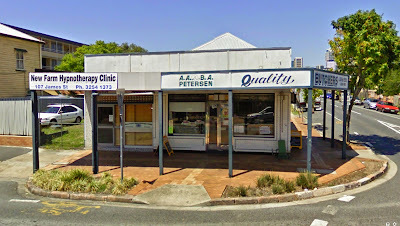 This is the shop, still bearing the Petersen name, pictured in 2009. 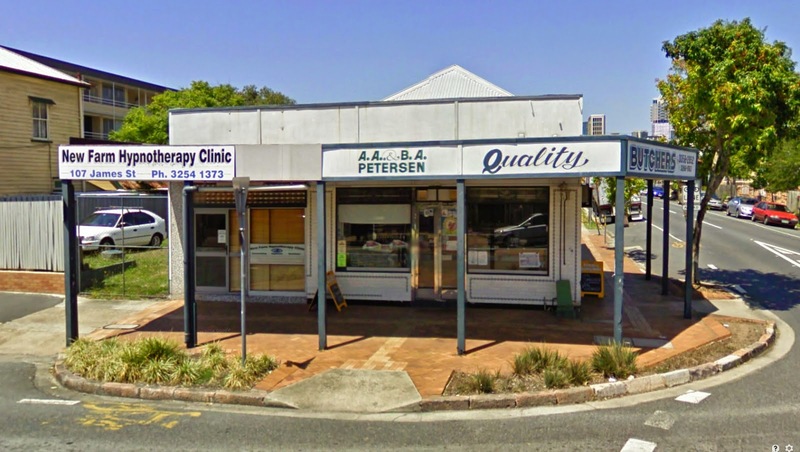 Although the Petersens sold to the George family in 2012 the shop remains, possibly the oldest traditional butcher shop in Brisbane. I was told about 20 years ago that the building at the corner of Eva Street and Waterworks Road in Red Hill had also been a state butcher shop. The building does look a bit too new, but it has been spruced up a lot recently - it used to be a gun shop and I'm sure anyone who regularly drove out Musgrave Rd and Waterworks Rd would remember it. I'd be interested to hear if anyone could confirm this story. Congrats on the award too! Your question prompted me to do a bit of digging and this is what I found. The ABC (http://www.abc.net.au/local/stories/2006/08/25/1723812.htm) reports that the building you describe was in fact a butcher shop owned by W Woodcock from 1900. Wikipedia (http://en.wikipedia.org/wiki/Paddington,_Queensland) says this: The old Ashton butchers building at 7-9 Latrobe Terrace (now a private business). Originally built in 1888 it housed Ashton's Butchers until the 1910s when it was taken over by the government and became the State Butchery. Seeing that there were only 90 state butcheries in the whole time that the scheme operated, it seems unlikely to me that both shops would have been state owned as they are not very far apart. But I guess - not impossible!